The core ideas in this framework were developed when I was running a strategy workshop for the executive team of a media company that has a large portfolio of TV and radio properties. I wanted to move the executives beyond thinking from a broadcasting mindset, and ran them through a session in which we looked at how people would consume media in the future – where they would be, how they would interface with media, and what they would consume. In essence, creating a person-centered view of how we engage with media. Thus the working title of the framework began as ‘Future of Media Participation’, looking not just at our media consumption, but also how we contribute. When the framework was finished it was clear the central aspect was the media lifecycle. As such the diagram has been renamed, however it stems from looking at how and where we consume and participate in media. The vast and ever increasing sea of content comprises not just media in its many forms, including video, audio, music, news, and commentary, but also conversations. Memes (units of culture that propagate) diffuse through the media lifecycle. Some are successful in reaching significant or even large audiences. Most are not. Memes’ success is determined by how people receive and act on them. We can consider all of our media experience as the selection of memes from the infinite pool of the sea of content. 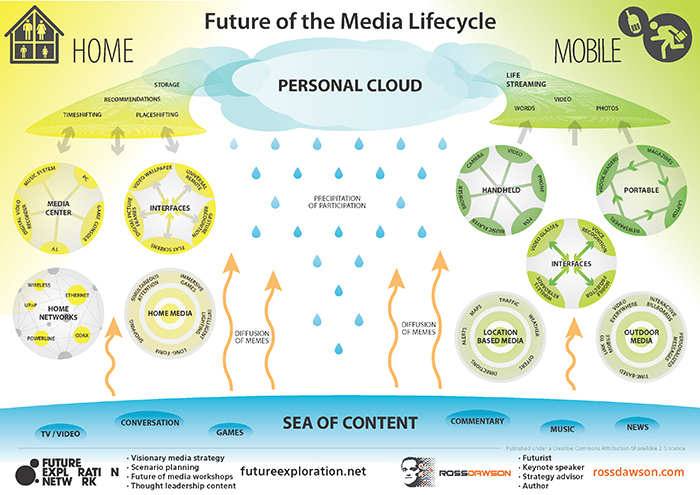 The most important development in the media lifecycle is the emergence of the ‘personal cloud’. This is where individuals keep all their content stored. This includes both purchased or downloaded media and content, everything they create themselves, and all opinions, ratings, and recommendations. The personal cloud is accessible from anywhere by its owner, and any parts of it can be made available to selected friends or the world at large. Most people will capture parts – or in some cases almost all – of their lives in the form of words, photos, video and more. That will be fed into the personal cloud to be accessed or made available at choice. Our personal cloud will increasingly be used for storage of our music, video and other media collections, making it available whenever and wherever we want – we can shift the time and place of media access as we choose. In addition our personal cloud will provide us with uniquely relevant recommendations based on our media preferences. From our personal clouds our participation falls back to the sea of content, in the form of our own content, remixes of existing content, and opinions. There are two primary spaces for our media participation: home and mobile (i.e. anywhere away from home). In each of these a new configuration of devices, interfaces, and media is emerging at the center of our media participation. One of our primary venues for media engagement is in the home. One of the most important trends over the last years has been divergence in media consumption patterns among different family members. The home of the future will be largely designed around media. Media participation in the home will shift to a hub which converges TV, PC, game console, music, and more. The specifics of how this happens and the winners and losers along the way are highly uncertain, however the convergence is inevitable. Our media experience at home will be transformed through new interfaces, including voice and gesture recognition, and screens in every room used for a combination of video, Internet, and digital picture frames, on walls, tabletops, and even floors. These will eventually be replaced by video wallpaper on almost every surface. One of the key characteristics of media at home is that simultaneous attention is often given to multiple media. Richer interfaces including 3D TV, surround screens, and immersive gaming goggles, gloves, and equipment. The media center will be linked to intelligent lighting throughout the house. Home shopping will become a far more engaging and interactive experience. Home media convergence requires a backbone of connectivity and integration. Current platforms proposed for this include Ethernet, powerline (power cabling), wireless including WiFi, and coax cable. A variety of standards for integration across devices will enable a seamless home media experience. We spend much of our lives out of home: at work, in cars, at airports, eating, meeting friends, in the street. Now this side of our lives is becoming as media-rich as our lives at home. The devices that are small enough to hold in our hands and put in our pockets have long transcended simple mobile phone or organizer functionality, to include camera, email, video and more. They are now converging into true mobile media centers. The winners in this convergence will be from a wide array of current providers. In addition to handheld devices, we often carry portable media devices. Newspapers and magazines are a traditional form of portable media. Laptops – and increasingly ultraportable devices – are already becoming mobile media centers. Over time printed media will shift to ebook readers and other e-paper devices. The major constraint on mobile media consumption is the size of the devices we can carry. Video glasses and mobile projectors will create big screen experiences wherever we go. Wireless keyboards, keyboards projected on tabletops, and voice recognition will help us to provide inputs to these devices while we are on the go. Increasingly media will be location-specific. Particularly when we are travelling, local alerts for traffic, weather, and airline or train schedule changes are critical. Maps, directions, and local alerts to news or activities will be automatically provided. Those who choose will receive relevant offers from local advertisers. Media will soon be inescapable wherever we go. We can expect video to be everywhere it is allowed, including on all billboards, sidewalks, café tables, buses, and more. Billboards will present us personalized ads based on our apparent gender, age, and status. Ads will vary depending on the time of day and location. Increasingly ads will be linked to mobile media content, for example using 2D bar codes and other content. Outdoor media will transcend advertising, increasingly offering content that attracts interest and viewers.